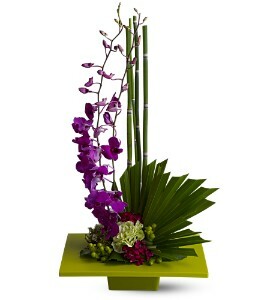 Send a floral gift that’s graceful, elegant and reaches to the sky! This artistic arrangement of exotic, vivid purple dendrobium orchids – perfectly placed against a tableau of burgundy and chartreuse blossoms, equisetum stalks, leaves and moss – will be a fresh, calming floral influence in any environment. Lovely in a home, and stunning in an office.